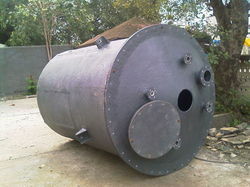 We are also engaged in offering comprehensive range of durable FRP reactors. FRP reactor is manufactured from qualitative raw material which is tested on various parameters before being subjected to production. FRP reactor are used in various types of industries and these are in high demand by our clients spread across the world because of it is based on international standard and are available at industry leading prices. We offer comprehensive range of durable MS - FRP lined reactors. This equipment is manufactured from qualitative raw material that is tested on various parameters before being subjected to production. These are in high demand by our clients spread across the world and is available at industry leading prices.